We all heard about the head line changes to GCSE which were announced last year – the changes to the grading for example. That grading will be on a nine-point scale, with 9 being the highest available grade. “A redrafting of the assessment objectives to make them sharper, and adjusting of the weightings to increase precision”. 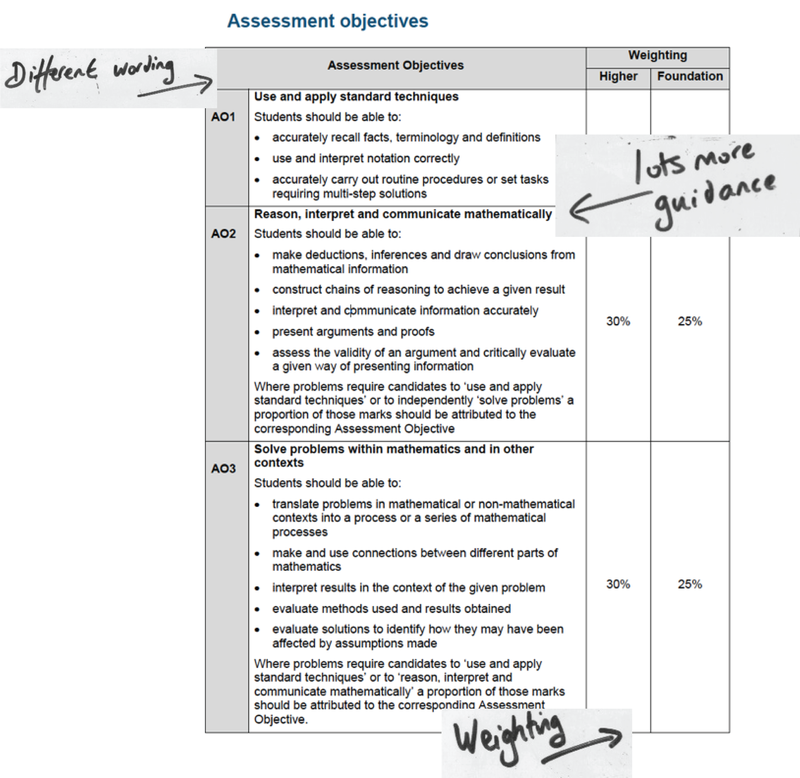 This outlines the ‘what do you need to know’ and ‘how will you be assessed’ in GCSE maths. There will be more content and more assessment needed. 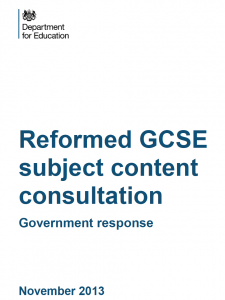 The full details for the changes in content are available in the DFE document; GCSE mathematics: subject content and assessment objectives. Assessment Objectives (AOs) are those skills that are related to, but not specifically subject content. For example, speaking and listening, writing, recall, selection and application. The Assessment Objectives are different for each subject. Some GCSE subjects have more AOs than others. In maths there were and still are 3 AOs. One of the other changes has also been to the assessment objectives. 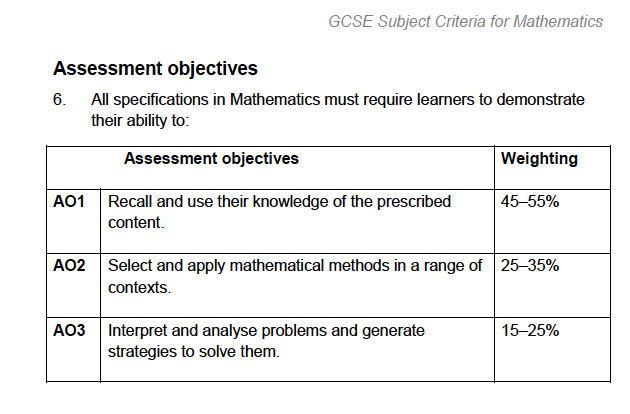 This detail can be found in the same ‘GCSE mathematics: subject content and assessment objectives’ document. The new GCSE will have more focus on making sure that every student masters the fundamentals of maths. These have been defined by the DfE as areas such as calculation, ratio and proportion. 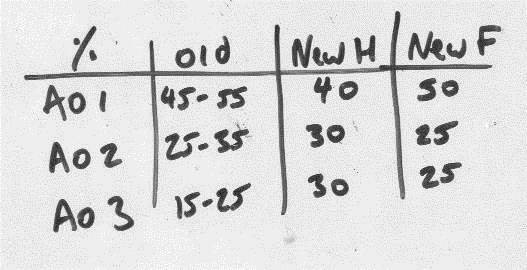 Like Michael Bird-boy’s day, the old (current) and new AOs have the same numbers, but they are very different. AO1 ‘Recall and use their knowledge’ has become ‘use and apply’ – and the move from AO2 ‘Select, apply methods… ‘ is now ‘reason, interpret and communicate’. Both changes suggest a stronger emphasis on application rather than recall. Secondly, the guidance has changed – in the old AOs that was it – in the new version there is far more guidance as to what that means in practice. So in the old AO3 where students needed to ‘ interpret and analyse problems’ Now they need to ‘solve problems within maths and other contexts’ but, for example they need to make connections between different areas of mathematics. All of this suggests to me a real desire to clamp down on the practice of preparing students for topics, and instead giving them holistic mastery of maths. And thirdly – the weighting has moved down the AOs with more marks for AO3 than before. 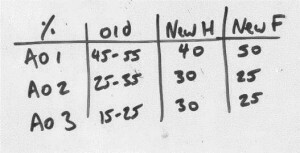 And a new separation of Foundation and Higher weighting. At first glance, it would be reasonable to conclude, particularly at tier F, there is little change as the weighting of each AO is about the same. However, when we start to look at the guidance it becomes clear that the AOs themselves are rather different. AO1 still includes recall and standard procedures but has been extended to include multi-step solutions and questions set in context, which may well have been classed as AO2 in the past. The new AO2 is all about interpreting information and communicating solutions and arguments giving these areas much more emphasis than previously. AO3 is still about solving problems but the emphasis is on translating problems into mathematical processes, linking different areas of mathematics and evaluating solutions. It is clear that any marks given for actually carrying out processes accurately must be considered as AO1 marks so that 50% of marks at Foundation tier is becoming spread across straightforward tasks and multi step questions and, now, within problem solving questions. Next Next post: How are we going to give students confidence in their Maths?